After taking a couple months hiatus, I am back writing for The Good Point. I should have a piece out every other Thursday. Today I wrote about the sorry state of the Columbus Blue Jackets. The vultures are certainly circling as the team rots in last place, and plenty of Leafs fans have turned their dreams of Bobby Ryan and Ryan Getzlaf into dreams of Jeff Carter and Rick Nash. According to Sportsnet reporter John Shannon, close friends of Nash are saying the star winger is willing to waive his no-trade clause, but won't outright ask for a trade. 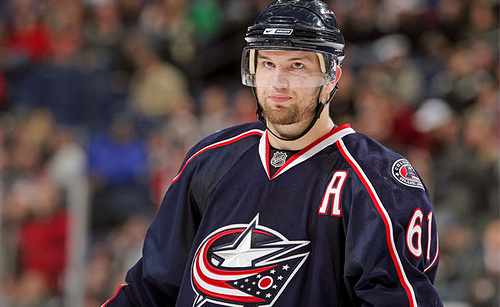 Whether true or not, it has certainly fueled the speculation that Nash is on his way out of Columbus. Elliotte Friedman of CBC made an excellent point in his 30-thoughts column this week, saying that with the Blue Jackets hosting the All-Star game next season, how can they trade Nash beforehand? Who is going to get the home fans excited? In my article for The Good Point I'm actually defending the Blue Jackets and saying that a rebuild now might be one of the worst moves the franchise can make. Seeing how Columbus is pretty much the antithesis to a model expansion franchise they probably won't heed my advice.